According to the 2019 Budget Speech, it is expected that South Africa’s real GDP growth in 2019 will rise to 1.5 per cent, and then strengthen moderately to 2.1 per cent in 2021. The Minister of Finance, Hon. Tito Titus Mboweni before the The Parliament of South Africa emphasises on ‘Accelerate inclusive economic growth and create jobs.’ He highlighted that the private sector is the key engine for job creation. Government’s policy actions aim to end the uncertainty that has undermined confidence and constrained private sector investment. 67CEOs and it corporate sponsor(s) believe that the growth of SMMEs, especially in the local communities such as Mpumalanga will contribute substantially to the GPD growth and job creation. With the support of corporate entities like Exxaro Resources through it ESD programme, 67CEOs will deliver its mandate to advance inclusive entrepreneurial ecosystems and increased economic inclusion while expanding financial and human capital for SMMEs. 67CEOs prides itself on creating avenues that seek to support, carry and advance ecosystems for budding entrepreneurs that continue to face systemic barriers to economic empowerment and independence. “Exxaro believes that unless we can power better lives for people, then we have not lived our purpose. Exxaro will lead economic transformation by investing in black youth owned small businesses that will create jobs in host communities and beyond. We operate in an environment of vast inequality, poverty and unemployment, and we are mindful of the fact that we can only bring about change if we all work together. That is why we are delighted to partner with 67CEOs Foundation to help nurture small and medium sized businesses.” says Mxolisi Mgojo, CEO of Exxaro. 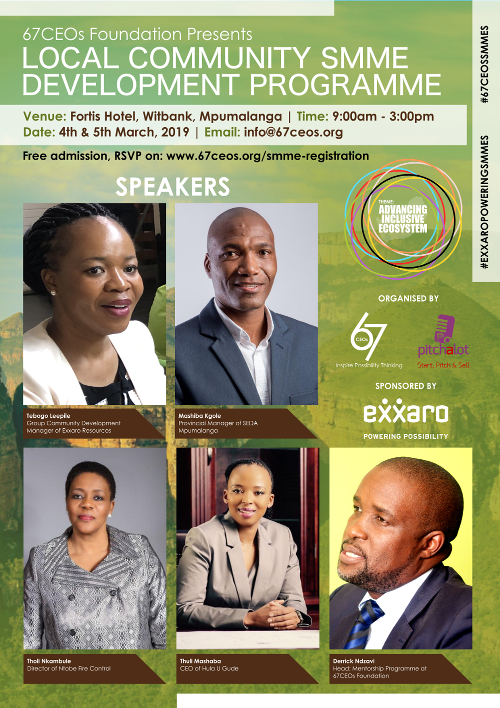 The 67CEOs Foundation will host the first edition of its Local Community SMME Development Programme 2019 sponsored by Exxaro Resources in Mpumalanga, themed “Advancing Inclusive Ecosystems”, which is free and open to the public. The organisation, which provides mentorship and impactful entrepreneurship workshops to newly-established industrialists and SMMEs in partnership with CEOs and seasoned entrepreneurs who volunteer their skills in service to inspire, mentor, coach and teach, will hold the two day events to educate local startup entrepreneurs and stimulate growth amongst the SMMEs. “For us as a nation to see high-growth businesses emerge and thrive, the entrepreneurship ecosystem must be inclusive at all socio-economic levels. Public and private institutional policies and support should be designed and executed so they close historical gaps, alleviate poverty and create sustainable employments,” says Sam Apata, convener of 67CEOs Foundation. Some of the key activities during the Local Community SMME Development Programme 2019 are: workshops, seminars, pitching sessions, speed mentoring and product demo. CEOs/mentors/facilitators will participate in panel discussions and lead relevant workshops focusing on advancing inclusive ecosystem that encourage entrepreneurship and job creation in South Africa. There will be masterclass sessions on Business Model Canvas and SMME Financial Management. SMMEs will take the platform to pitch their business and stand a chance to win grant funding to purchase basic tools and equipment for their business growth. 67CEOs Foundation is an independent, South African registered, enterprise development non-profit organisation that hosts amongst others Mandela Day Entrepreneurship Drive every 18 of July and Global Entrepreneurship Week initiatives in November annually. In partnership with title sponsor, Exxaro Resources, 67CEOs Foundation will host over 100 SMMEs during Local Community SMME Development Programme 2019 sponsored by Exxaro Resources in Mpumalanga at Fortis Hotel, Witbank, Mpumalanga, on the 4th & 5th of March, 2019 at 9:00am – 3:00pm. “SMMEs in Mpumalanga are invited to join great leaders in business at this entrepreneurship growth programme. This is a great platform for education, inspiration, reflection, celebration, dialogue, networking and investment. Come and acquire the right knowledge that will position you for success in 2019 and beyond,” says Apata. The Primary Spokesperson for 67CEO’s Foundation is Derrick Nzavi who can be contacted on +27 81 761 8997. Exxaro is a South African-based diversified mining company listed on the JSE and included in the Responsible Mining Index. Our portfolio of coal operations includes mines in Mpumalanga and the Limpopo supplying to Eskom, other domestic markets and the export markets. Our investment portfolio also includes a 50% interest in Cennergi Pty Ltd, a joint venture with Tata Power, which has developed two wind farms with a combined generation capacity of 229MW (10% of the currently installed capacity of South Africa’s Renewable Energy Independent Power Producer Procurement Programme (REIPPPP).